The University of South Florida College of Arts and Sciences and the Humanities Institute will host Yale Historian and food scholar Paul Freedman as part of the Frontier Forum lecture series on Thursday, Mar. 21, 2019. 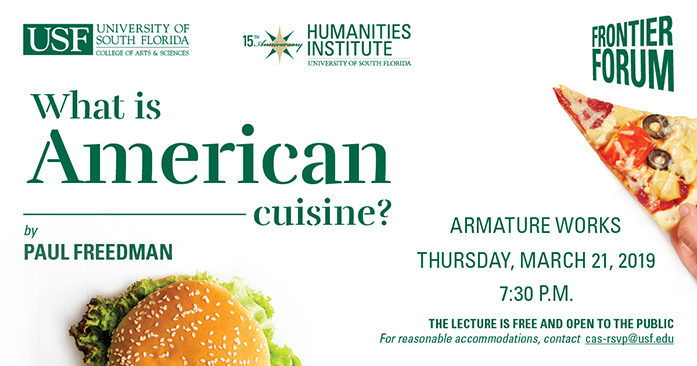 Freedman will speak at Tampa’s Armature Works at 7:30 p.m., where he will discuss the evolution of the American food industry, how it reflects cultural and historical trends, and shifts in American cuisine tastes and preferences. Freedman is a member of the American Philosophical Society and the American Academy of Arts and Sciences. His most recent book, “10 Restaurants That Changed America”, addresses the entangled history of America’s taste in food with American history itself, profiling iconic restaurants like Delmonico’s, Antoine’s, The Mandarin, and others. “Foreign observers often say there is no such thing as American cuisine, only fast food, or (more favorably) a miscellaneous collection of international, immigrant cuisines,” Freedman says. Using examples from regional traditions, Freedman will outline the history of American food and the current revival of the movement towards seasonal, local, and sustainable cuisine. The Frontier Forum lecture series is sponsored by the USF Office of the Provost and the USF College of Arts and Sciences. Since 2010, the series has hosted several notable public intellectuals such as Jane Goodall, Neil deGrasse Tyson, Rory Kennedy, Jeffrey Toobin, and Roxane Gay. Students, faculty, staff, and members of the Tampa Bay community have had the unique opportunity to learn from these accomplished speakers. This Frontier Forum event is free and open to the public. Tickets are not required but seating is on a first come, first serve basis. For reasonable accommodations, please contact Terrie Maines at cas-rsvp@usf.edu.